Bedford scored twice in the final minutes to pick up a valuable bonus point win at in-form London Welsh on Saturday, triumphing 38-25. The Blues, who made six changes to the side that lost at home to Nottingham, opened the scoring in the fourth minute with a superb try when Dean Adamson’s excellent break was finished off by Will Carrick-Smith. Myles Dorrian converted, while the visitors extended their lead to 10-0 when Dorrian kicked a penalty. London Welsh kicked into gear soon afterwards, Kieran Murphy scoring a close-range try, before on the half hour, Kieran Phillips went over, with Glyn Hughes’ boot making it 12-10 to the hosts. The Blues looked certain to score in the 38th minute through Piers O’Conor, but he was somehow denied by Glynn. Bedford dug deep and managed to go ahead on the stroke of half time as Mike Le Bourgeois intercepted a pass and released George Perkins to hurtle over the line. Dorrian’s conversion hit the post but the Blues led 15-12. Welsh came out in a determined mood after the interval and were back in front when Nathan Morris was at the back of a driving maul to dot down with Hughes adding the extras. Bedford narrowed the gap to a point in the 58th minute when Dorrian converted a penalty. The match continued to ebb and flow as Joe Carlisle’s penalty saw Welsh make it 22-18. However, Blues had their noses in front inside the final 10 minutes with replacement Jake Sharp slotting two penalties over, while Welsh were down to 14 as Miles Mantella was carded for a high tackle on Jordan Burns. With five minutes remaining, Welsh’s impressive scrum did the business again to earn a penalty and Carlisle slotted it to make it a one point game once more. 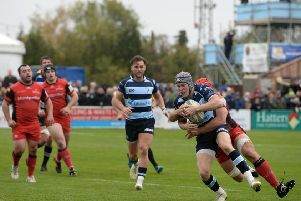 Bedford had lost their last two games by two points and a single point, but that wasn’t to be the case this time as they ran in two late tries to secure a bonus point victory. First, Paul Tupai picked up the ball and burst away before drawing the final man and popping the ball to the waiting Burns to score under the posts, Sharp converting. Then Burns showed an amazing turn of pace to break clear before sending Perkins in to score his second of the afternoon and Sharp converted to wrap things up for the visitors who climbed to ninth in the table.